Added on January 14, 2015 by Judith Goddard. What happens when a body that by all rights should fall—e.g., the roadrunner escaping the coyote by hurtling across thin air—remains, in flagrant contradiction of the laws of physics, suspended? Artist Rosa Aiello and writer and curator Kari Rittenbach will examine how animation acts as a technique and as a state that may be suddenly and surprisingly assumed by seemingly inanimate things. They will explore the ways in which filmmakers lend matter agency, will, or activity by means of mechanical techniques and editing tricks that alternately reveal, conceal, amplify, and defy the grip of natural forces on persons as well as objects. How does the manipulation of these forces provide credibility to realms in which standard causality is perturbed, if not jettisoned entirely? The visceral effect of such works on the viewer, which may even lead to physical disorientation, is a tribute to the animator's craft. Aiello will read from her forthcoming Triple Canopy project on computer-generated representations of physicality, affect, and liveliness, and the feelings these representations inspire. Then she and Rittenbach will screen film and video works by artists Bas Jan Ader, Hannah Black, Robert Breer, Ian Cheng, Judith Goddard, Alex Hubbard, Dina Kelberman, Nina Könnemann, David Lamelas, Maggie Lee, Rivane Neuenschwander, James Richards, and Erwin Wurm, as well as a work by Aiello. The reading and screening will be followed by a discussion with Rittenbach and Aiello. Added on November 30, 2014 by Judith Goddard. Lyrical Doubt is part of the screening "Time, a Hesitant Smile: Film, Broadcast and Time Travel" - III - programmed by Jacqui Davies. The concluding programme of Time, a Hesitant Smile takes as its starting point the material processes of filmic editing as contained moments of time travel. From the disembodied voice and sonic spectres that echo in the present, to the layering and fragmentation of image and duration, the hesitant smile of time is revealed as an uncertain reality. Added on November 2, 2014 by Judith Goddard. Added on October 19, 2014 by Judith Goddard. Judith Goddard - in conversation - with Jean Wainwright - at Chandelier Projects, 4pm Saturday the 1st November 2014, The exhibition will be open from 3pm. For details see website below. Added on September 21, 2014 by Judith Goddard. In Terra Conductor, sculpture, the moving image and photographic works manifest focal points in two and three dimensional space, drawing our attention to the axis of the horizontal and vertical, both within landscape and the gallery, in lines marked out in bronze, photographic emulsion or moving images. In the video work Lowest Point, Kati Thanda (Belt Bay), shot at the lowest point in Australia, we see a shimmering close-up of a salt-lake with a mirage in the distance, and in the work Wrap, a spider repetitively loops a cocoon of silk around its prey. The sculptures, Terra Conductors, are a collection of bronze, tripod-like structures with elongated uprights made from cast bronze rods. These works consider an axis point between physical and psychological space. The series Bronze Photograms use the sculptures to conduct light onto paper. The resulting unique photographic images are in focus only at the point where the form of a Terra Conductor and light strike the paper together: the upright of the sculpture creating a ghostly white shadow on the deepest black of emulsion. All these works consider the intersection of “site” and “sight”, two concepts that further inform the artist’s practice. An essay by Kathy Noble can be found on this website in 'selected texts'. Added on April 8, 2014 by Judith Goddard. Added on February 12, 2014 by Judith Goddard. 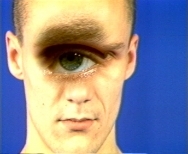 The work 'Celestial Light & Monstrous Races' a 4min looped analogue video work from 1985 will be showing on monitor in the gallery at Tate Liverpool for the show 'Keywords: Art, Culture and Society in 1980s Britain'. which opens on the 28th February 2014. Added on October 24, 2013 by Judith Goddard. Lake Eyre from the air – where salt meets the sky. who invited me to Adelaide to examine the MA exhibition of a student there. Added on August 17, 2013 by Judith Goddard. Added on August 15, 2013 by Judith Goddard. Traveling to Norway & Scotland, now in production. Administered by the Elephant Trust, the Joanna Drew Travel Bursary was set up to provide a bursary each year to enable an artist or someone involved professionally in the visual arts to broaden their experience through travel, without restriction as to age or nationality.